Educational Rankings and Economic Success: How Clear is the Connection? The findings, I have to admit, show that the United States needs to urgently accelerate student learning to try to remain competitive in the knowledge economy of the 21st century. Americans need to wake up to this educational reality, instead of napping at the wheel while emerging competitors prepare their students for economic leadership. Out students need better knowledge and tools to prepare them to compete in the global economy. This is not a new argument, nor is it one restricted to the U.S. context. Advocates and detractors of education reform continually make reference to international competition, often using PISA and TIMSS rankings to bolster their argument. They draw an explicit link between these rankings and economic performance. So, let’s take this argument at face value and test it on it’s own merit. One nation appears on both lists: Japan. This is even more problematic, not one nation (or region in the case of Macao) that ranked in the top ten in 1995 appears on the per capita list. It should go without saying there are a number of problems with the simplistic analysis used in public policy debates. For starters, although we often say “Nation so-and-so is ranked Xth in the world,” the reality is that the majority of the nations in the world don’t participate in TIMSS or PISA. Luxembourg, Qatar, and China did not take part in the 1995 TIMSS. 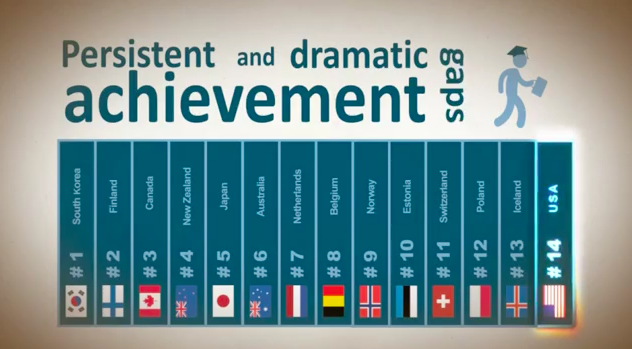 We can hardly expect nations that didn’t take the test to appear on our top-performers list. In fact, only 43 nations in the world participated in that exam in 1995. That number has increased over the past eighteen years; sixty-four nations, cities and regions took the most recent PISA exam in 2012. However, we are still working with an incomplete dataset. In addition, we’re not even using simple linear regression analysis in this blog post. We’re just comparing top-ten lists and looking for commonalities. Scholars studying comparative education know this is an invalid way on measuring the effect of education on economic growth. The link between a nation’s education system and its economy is a complex relationship between two adaptive, emergent systems. A relationship that can’t be measured by comparing GDP and PISA scores. We know this. It is an undeniable fact that countries who out-educate us today will out-compete us tomorrow. The weaknesses in our argument above should serve to reveal the weakness in the president’s argument. Politicians define educational success with league tables and make ill-defined linkages to the nation’s economic rankings every day. Just by looking at the rankings it should be clear that this argument fails to hold up by its own logic. ← Education: Cost or Quality? The comparison of a countries educational performance based on a mean score tells us little. There is generally little difference between the scores of students at the top of the scale. The real difference lies in differential between high and low scores and the level of investment countries throw at the problem.